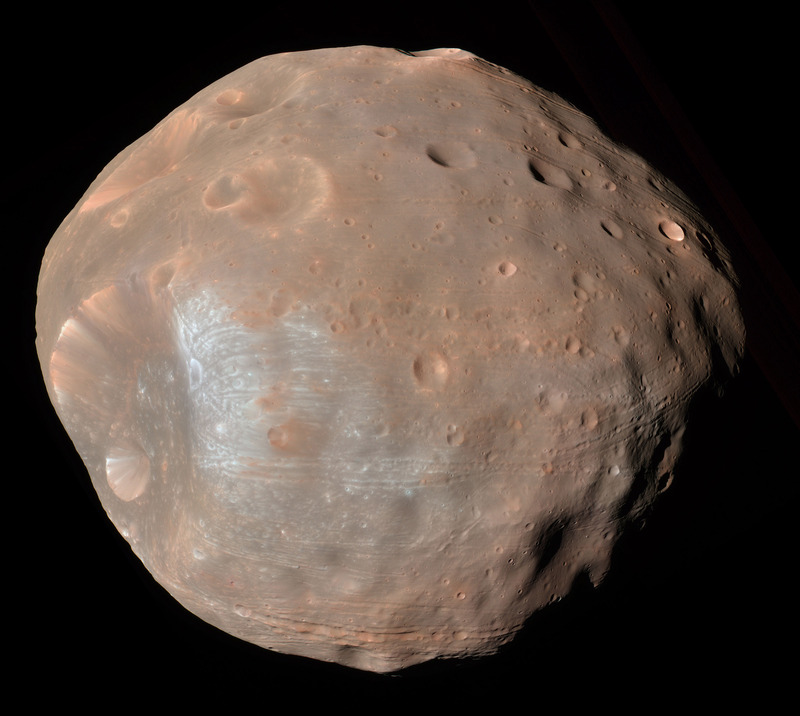 The Martian moon, Phobos, has a two-coloured surface that has been difficult to explain. In a Nature Geosciences paper this month, researchers at ISAS・JAXA have suggested a novel explanation that may shed light on how the moons of our red planet were born. A long standing debate exists about the moons of Mars. The two misshapen satellites may be captured asteroids or the product of a giant impact with the planet. Which scenario is correct should be evident in the moons’ composition. If the pair were captured into orbit by the gravity of Mars, then they would have formed elsewhere in the Solar System. This should give the moons a mix of minerals that differs from that of Mars. On the other hand, if the moons coalesced from debris created when Mars was struck by a large planetoid, then they should be formed from a mix of material from Mars and the impactor. 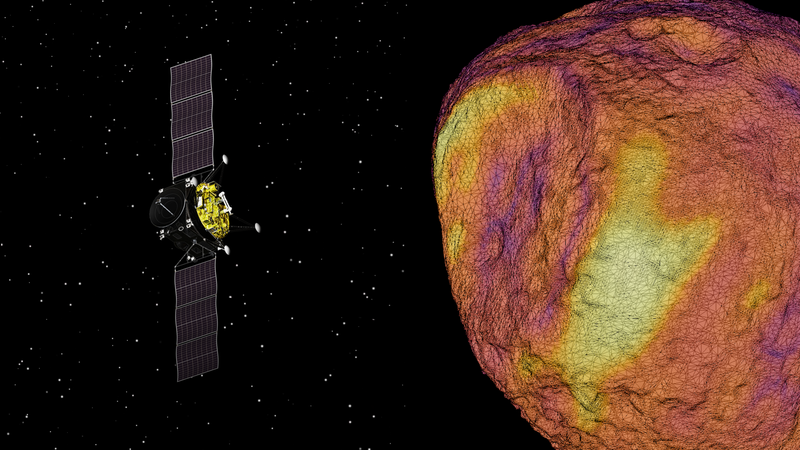 Observations of Phobos have added to this mystery. The larger of the martian moons orbits close to Mars with a period of just 7 hours and 39 minutes. Too small for gravity to have created a spherical shape, Phobos has the irregular structure of a lumpy potato that is common of asteroids. Most intriguingly, when Phobos is viewed through cameras sensitive to both optical and infrared light, its surface appears as a reddish colour interspersed with blueish regions that suggest the presence of different minerals. If the cause of the dichotomy could be confirmed, it might reveal a clue as to how to moons formed. Image of Phobos captured using the optical and near infrared filters of the HiRISE camera on the NASA Mars Reconnaissance Orbiter, showing both red and blue regions. (credit: NASA / JPL / University of Arizona). Phobos’s orbit is slightly elliptical, with an eccentricity (degree of ellipticity) of 0.015. This is sufficiently close to a perfectly circular orbit with an eccentricity of zero that the potential impact on the moon has been previously ignored. However, it was this orbital distortion that Nicola Baresi found interesting. 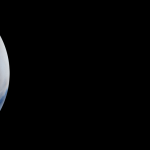 Baresi is a member of the flight dynamics team for the Martian Moon eXploration (MMX) Mission; an ISAS・JAXA mission to explore the martian moons that is planned for launch in the mid-2020s. The ellipticity of Phobos’s orbit means that the moon’s distance from Mars varies and results in a fluctuation in the gravitational pull from the planet. Baresi realised that this gravitational fluctuation meant a change in the force material experienced on any hill or slope on the moon’s surface. Miss your footing while climbing Mount Fuji, and the Earth’s gravity will send you tumbling to the mountain bottom. On the slopes of Phobos, you would feel both the gravity of the moon and also an additional force from the close proximity of Mars. Changes in this force would feel equivalent to a shift in the gradient beneath your feet, potentially causing you to lose your balance and take a slide. It was this effect that caused Baresi to show his results to Ron Ballouz. Also part of the MMX mission, Ballouz has previously studied how the surface material of asteroids can move during a fly-by past the Earth. 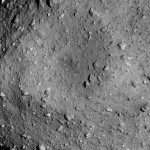 In that case, it was the Earth’s gravity that varied on the asteroid during the fly-by and caused erosion of the asteroid’s surface. Using a computer simulation of a bed of granular material angled at different gradients, Ballouz modelled what happened if that gradient were to vary by an amount equivalent to the varying pull of Mars. The grains in the simulation were packed to form a porous structure similar to that thought to be present on the surface of Phobos. As their world tilted, the grains began to creep. 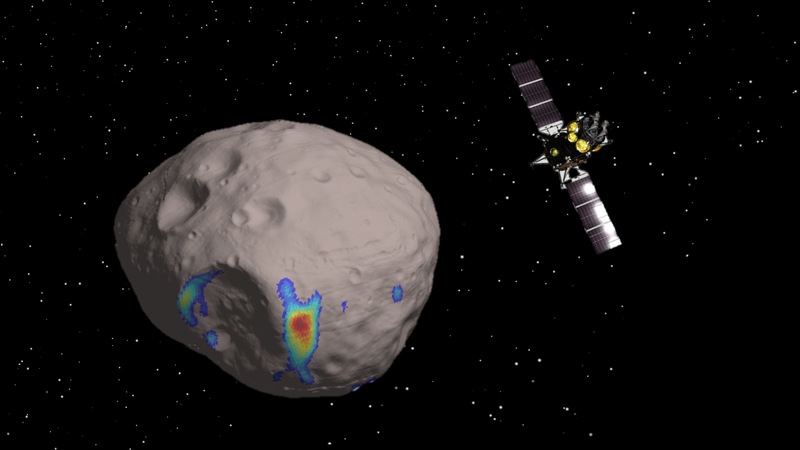 Artist impression of the MMX spacecraft orbiting Phobos. Colours indicate regions of strong cold flow around the Stickney crater on Phobos. This can be seen to align with a strongly blue region in the image of Phobos above. 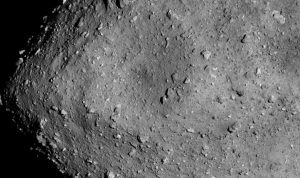 (credit: Baresi, Ballouz, JAXA). Predictably, grains on a steep gradient experienced the strongest flow of material. Yet, even grains on flatter ground with relatively small variations in slope did not remain stationary. The researchers dubbed this slow movement “cold-flow”. Exactly what this might mean for Phobos was identified by Sarah Crites. A planetary geologist on the MMX mission team, Crites realised the movement of grains might explain the colour dichotomy on the surface of Phobos. Crites proposed that the blue regions were material buried beneath the top layer of Phobos’s surface that was being exposed as these grains shifted. That subsurface material should appear different from the top layer of a celestial body is not surprising. Radiation from the Sun and the high energy particles of the solar wind can chemically alter rocks in a process known as space weathering. If the blue regions on Phobos are freshly exposed material, then their composition should match the inherent material that forms the moon. Members of ISAS and the MMX mission team (photo for illustrative purposes). From left to right, Takayuki Shimoda, Ayumu Tokaji, Nicola Baresi, Hiroka Inoue, Lucie Riu, Sarah Crites, Ron Ballouz and Naoya Ozaki. 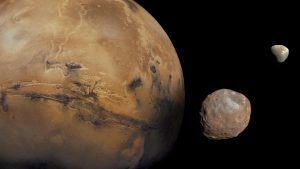 Observations by NASA’s Mars Reconnaissance Orbiter and ESA’s Mars Express of the blue regions on Phobos have not detected any mafic minerals, such as olivine or pyroxene. These rocks are expected to be present if Phobos was carved from the mafic-rich Mars. Their absence could point against the impact scenario for the Martian moons, but there could also be other explanations. One alternative options is that Phobos grains are well mixed with opaque materials such as carbon. Mineral composition is established by looking at which wavelengths of light are absorbed by the rock. But carbon could block the light from being absorbed by the mafic minerals. The only way to be absolutely certain is to collect a sample of material from below the surface of Phobos. 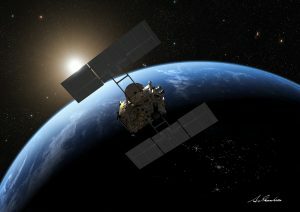 The MMX mission plans to achieve exactly this goal, collecting a sample from one of the Martian satellites and returning it to Earth in the late 2020s. The spacecraft is equipped with coring apparatus, enabling material to be gathered at a depth of up to 10cm. Combined with detailed observations of the moon’s surface, the MMX mission will resolve both the composition of the moon and also test the theory of cold-flows. If cold-flows are setting the surface of Phobos into (slow) motion, this will impact our understanding of the Solar System. Small bodies such as asteroids, comets and moons are remnants of the planet formation process. Their orbits and composition reveal how material moved in the Solar System, including biologically relevant molecules such as water and organics. But in order to use small bodies to map out our history, we need to understand how their material shifts and changes. Nature Geosciences journal paper, Ballouz et al. We’re going to the Martian moons!